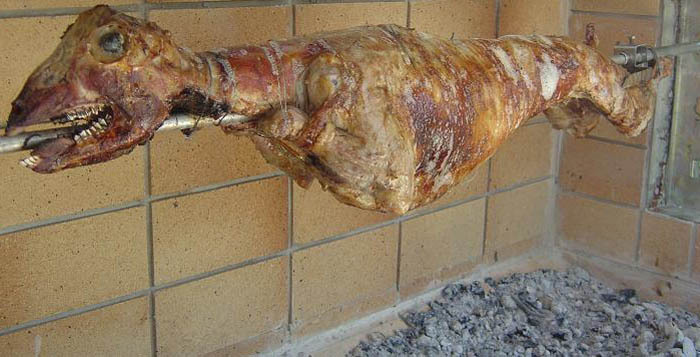 Easter lamb is an old tradition in Greece. Housewives get up really early to prepare everything and then the men put the lamb on the spit and start turning it over the fire till it's ready. It is really delicious! To serve 6-8 persons, you need a lamb that weights about 5 kg! On Easter Sunday Morning, the fire is started at about 7.00 am to ensure that the wood is reduced to glowing embers by the time the roasting starts. The lamb or goat, having been properly cleaned, is rubbed with lemon all over his skin and seasoned with salt, pepper both outside and inside. Then the souvla, the long round iron stick, having also been properly cleaned and rubbed with lemon, is passed through the animal from one end and out through the head. The back feet are secured by passing one through the muscle of the other and are then tied with wire. It is also recommanded to tie with wire the spine of the lamb on the spit.